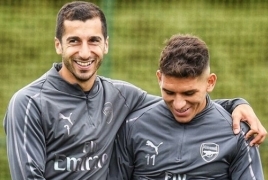 PanARMENIAN.Net - Both Uruguayan and Armenian midfielders Lucas Torreira and Armenian Henrikh Mkhitaryan looked to be in high spirits as Arsenal began their preparations for their clash with Newcastle United this weekend, The Sport Review says. The north London side are currently gearing up for their trip to St James’ Park as they look to try and make it three wins in a row in the Premier League this season. Attentions will now turn to the return of the Premier League and Arsenal’s players reported back to London Colney to begin their preparations for Saturday’s trip to Newcastle United. Torreira is hoping to make his first Premier League start for Arsenal since his move to the club from Sampdoria back in the summer transfer window. And the Uruguay international looked to be in high spirits as he trained alongside Mkhitaryan at London Colney this week. New Arsenal manager Unai Emery has been tasked with steering the Gunners back into the Premier League’s top four this term after they missed out on Champions League qualification for the last two seasons running.